US Dollar: March USD is Up at 95.910. Energies: March '19 Crude is Down at 53.14. Financials: The Mar 30 year bond is Up 9 ticks and trading at 145.31. 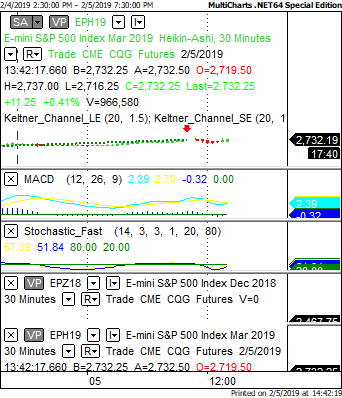 Indices: The Mar S&P 500 emini ES contract is 20 ticks Lower and trading at 2727.00. Gold: The Feb Gold contract is trading Down at 1317.80. Gold is 15 ticks Lower than its close. At this hour Asia is trading Higher with the exception of the Aussie and Singapore exchanges which are trading Lower at this time. Currently all of Europe is trading Lower at this time..
Prelim Nonfarm Productivity is out at 8:30 AM EST. This is major. Prelim Unit Labor Costs is out at 8:30 AM EST. This is major. Trade Balance is out at 8:30 AM EST. This is major. Crude Oil Inventories is out at 10:30 AM EST. This is major. 10-y Bond Auction starts at 1 PM EST. Major. 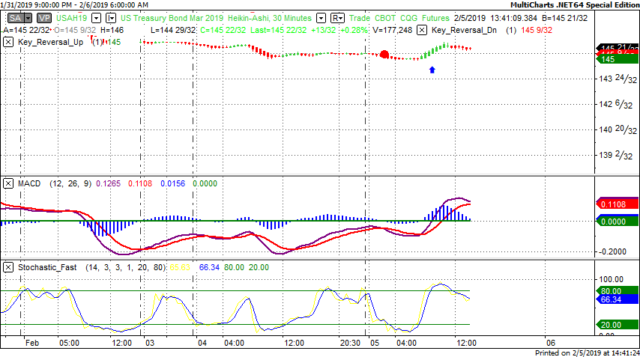 Yesterday we gave the markets a Neutral bias as the indices didn't seem to have much in the way of correlation or direction yesterday morning. The Dow rose by 172 points and the other indices rose as well. Today we aren't dealing with a correlated market and our bias is to the Downside. Yesterday the markets seemed to be floundering between positive and negative territory as we suspect everyone was awaiting some clue or insight as to the State of the Union address. No doubt there'll be a lot of blame game and finger pointing. The President will probably blame all the woes of the world on the Democrats and certainly the Democrats will respond in their rebuttal. What DC doesn't seem to understand is that We the People are the ones who suffer unless they start working together. As a follow up to the above, President Trump actually appeared presidential during the State of the Union address. He did not call for an emergency regarding the wall with Mexico, as many thought he might. He was also (in my opinion) tame on his criticism of the Democrats. As I write this the crude markets are Lower and the S&P is Lower. This is not normal. Crude and the markets are now reverse correlated such that when the markets are rising, crude drops and vice-versa. Yesterday March crude dropped to a low of $53.47. It would appear at the present time that crude has support at $53.00 a barrel and resistance at $56.00. Remember that crude is the only commodity that is reflected immediately at the gas pump. Please note that the front month for crude is now March. Last month OPEC met once again to cut production but the price of crude is starting to climb. The question is if whether this is temporary or something more permanent. If trading crude today consider doing so after 10:30 AM EST when the inventory numbers are released and the markets give us better direction.